Keep your signature metal refillable flacon filled at all times with the Mugler A*Men Eau de Toilette Spray Metal Refill. Simply pop into your existing casing and go. Remove the top of the metal case and slip this complete refill bottle inside. Replace the top and you're good to go. Thierry Mugler A*Men Eau de Toilette Spray Metal Refill 100ml is rated 5.0 out of 5 by 5. Rated 5 out of 5 by Kristin from Another wonderful EDT spray. 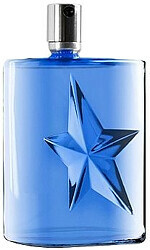 My husband has two favourite EDT's and so have I; this is the other one, A*Men. A wonderful fragrance that wafts past you and lingers in the air, only in a good way. This fragrance does not disappear in the air like most of the others so why bother with them; stick to quality and be satisfied. Rated 5 out of 5 by Milli from Brillant This item was a gift.. Very prompt delivery , boxed up well . Have used this company before they will not let you down. Many thanks. Rated 5 out of 5 by Iaabg from Unique scent that is Name in this industry Absolutely distinctive fragrance, long-lasting and changing with the time - First class performance!